Welcome and thanks for joining us at our June Release Day par-tay! We've got a new Fresh Baked Kit and we're thrilled to share it with you! 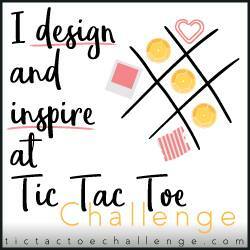 It's called This and That and features tons of trendy Studio Calico product from the brand new Here and There line -- fresh, happy colors; fun, retro images; and lots of hand-drawn style, too! The Lawn Fawn clear stamp set included in June's kit is Critters at the Dog Park, a whimsical collection of pooches and best friends! This entire kit is PURRFECT for kicking off SUMMER!! Bazzill paper flower, 7 Gypsies tiny clothes hanger, Making Memories mini brads, buttons galore and MORE! You can pick up a This and That kit by clicking on the BUY CURRENT KIT tab, and get it shipped to you super quick. This one may sell out fast, so don't miss it! 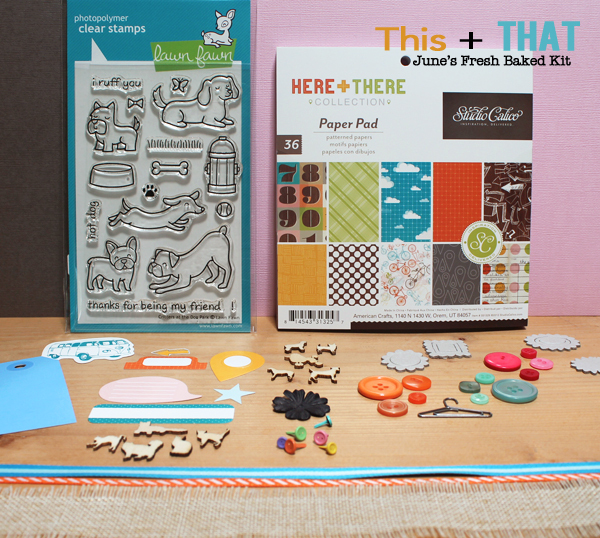 And, you know we dig sharing our love of paper crafts, so we've got a MINI Fresh Baked Kit to give away! It's just a little something to whet your appetite for card making --- PMB style! You'll have until the end of the week to enter, and there are ways to earn multiple entries, so check back every day. We'll announce the winner here on the blog, on our Facebook page, and via Twitter. What a fun kit to work with! Thanks for a chance to win. What a cute new kit! One think I am looking forward to this summer is more time...to craft, to work in my garden, to spend with my 7 year old! Looks fun!! The doggies are sooo cute. super fun kit and LOVE the hop!!! Looking forward to swimming with the grandkids. My first time to this website. You've got some cute kits going on! Thanks for the opportunity to win. This my be the most tempting kit yet! As to summer, I'm waiting patiently for those warm temps to arrive to stay! I've been wanting to purchase this new Lawn Fawn stamp set. Luv it! Camping!!! We didn't get to go at all last year! I'm heading back to work after nearly 6 months off (foot surgery), so no big plans for summer here! But maybe a day or two up at lovely Lake Tahoe can be arranged! What an adorable kit...love the cute dog stamps! And I am looking forward to spending lots of time with my 3 year old grand-daughter in the pool! Ooo, too cute! The puppies are adorable. I cannot wait for summer to be fully here so I can hit the beach! This is a super fun kit! I am off to see what the DT has made! What a cute and darling kit!! Getting away--camping, and then Germany! I hope I can have a less stress season! Been living in a stress environment for the last few months! The sunshine and lots of outdoor time with the kids! Fabulous kit! Thanks for the cute giveaway. Looking forward to being outdoors with my sons! Thanks for the giveaway! Cute kit!! I am looking forward to time off to stamp! What darling dogs! Great kit!! I'm looking forward to not having to do school pick up and drop off!